Every so often, whenever you’re in Flower Garden, a bouquet request will arrive. You will see a red exclamation point on the top right of the garden screen. Tap on that button and you’ll see the full request. 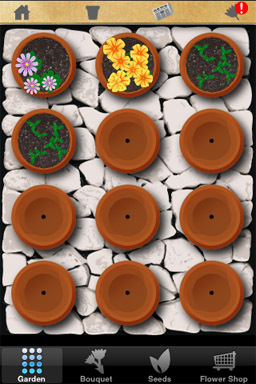 Create a bouquet with exactly the flower types and amounts listed to fulfill the request. It’s important that you don’t have any other flowers than the ones listed in the request or you won’t be able to redeem your bouquet. Also, very young flowers won’t count towards the request. 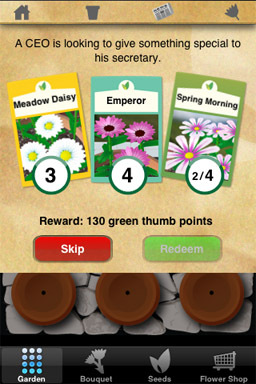 Once you redeem the request, you’ll earn the amount of Green Thumb Points listed in the request and your bouquet will be taken away. If you decide you don’t want to do a particular request, press the skip button. A different request will come along in a few minutes.